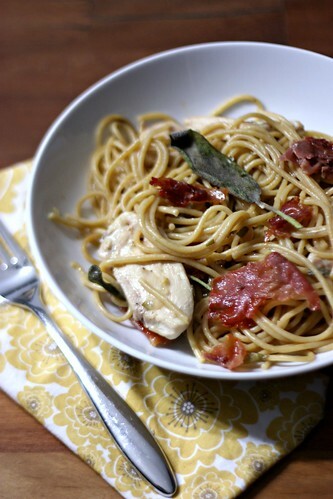 Skillet Chicken Saltimbocca Spaghetti – Elly Says Opa! A while back, I had a friend tell me that if there was anything I didn’t like, I should just wrap it in prosciutto or stuff it with goat cheese and then I’d be cool with it. And, you know, she wasn’t wrong. Prosciutto is one of my favorite things. I love it for its saltiness. I love that it can be eaten on its own, with vegetables, in a sandwich, with fruit. I love that you can crisp it up and it takes on a whole new greatness. It’s no wonder, then, that I also love chicken saltimbocca. And of course, this recipe for a version that includes spaghetti and is all cooked in one pan jumped right out at me. We’ve had this dish at least three or four times now, and it has yet to disappoint. Clearly, I thought I would enjoy this, but I was surprised at how delicious it was given its simplicity and relatively short list of ingredients. Tom asked if this was an America’s Test Kitchen recipe after eating it because “they always nail it.” Ian, true to form in this household, has started putting together two-word phrases that are largely about food. So the last time we had this, I got to hear “more pasta?” about a million times. I add a higher broth to water ratio than the recipe (and have gone even higher than what I’ve listed below) but I do love salt. If you are more sensitive to it, you may want to stick with the original, which is 3 cups broth and 1.5 water. The prosciutto and capers obviously add a saltiness to the dish, too. The lemon juice and zest, though, really brighten this dish up. Heat 1.5 tablespoons of the oil in a large, nonstick skillet over medium-high heat. Add the prosciutto and cook, stirring occasionally, until crisp (about 5 minutes). During the last 30 seconds or so, add the sage leaves and cook until crisp. Using a slotted spoon, transfer the prosciutto and sage to a paper-towel lined plate. Season the chicken with salt and pepper and then place in the hot skillet. Cook until browned and just shy of cooked through. Remove the chicken and keep warm. Add the remaining 1/2 tablespoon oil to the skillet. Stir in the onion and cook over medium heat until softened, about 5-6 minutes. Stir in the minced sage, garlic, and red pepper flakes, and saute until fragrant, about 30 seconds. Add the flour and cook for one minute before whisking in the wine. Simmer until reduced by half, about 1-2 minutes. Slowly whisk in the broth and water. and then stir in the pasta. Increase the heat to medium-high and cook at a vigorous simmer, stirring often (I like to use tongs for this), until pasta is tender and sauce has thickened (about 12 minutes for white, and about 14 for whole wheat). Add the chicken and cook just a minute longer, until completely cooked and warmed through. Stir in the capers, butter, lemon zest, and lemon juice, and season to taste with salt and pepper. 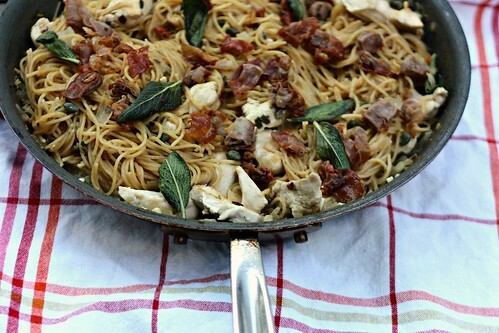 Serve the pasta with the crispy prosciutto and sage.